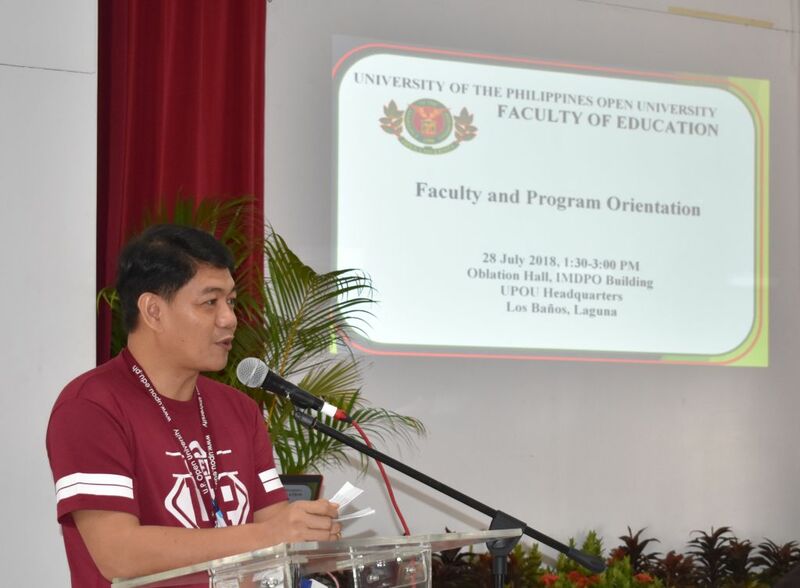 With the aim of helping the incoming new students to be familiarized with the faculty and its non-degree and degree programs, the Faculty of Education (FEd) of the University of the Philippines Open University (UPOU) conducted its Faculty and Program Orientation on 28 July 2018 at Oblation Hall, IMDPO Building, UPOU Headquarters, Los Baños, Laguna. About 52 newly admitted students from Associate in Arts (AA), Bachelor of Education Studies (BES), Diploma in Social Studies Education (DSSE), Graduate Certificate in Distance Education (GCDE), Diploma in Language and Literacy Education (DLLE), Master of Distance Education (MDE), Diploma in Mathematics Teaching (DMT), Doctor of Philosophy in Education (PhD-Educ) and Professional Teaching Certification (PTC) attended the orientation. Dr. Ricardo T. Bagarinao, Dean of FEd, welcomed the participants of the event. He gave a brief overview of the Faculty of Education and clarified that UP Open University is one of the constituent universities of the University of the Philippines, distinct from UP Los Baños and UP Diliman. He also underscored the essence of online learning along with its challenges and benefits. “Learn what you need to learn, but never lose a moment to enjoy along the way”, Dr. Bagarinao remarked. Dr. Ricardo Bagarinao emphasizes that online learning is independent learning. Asst. Prof. Charisse Reyes, Faculty Secretary, introduced the members of FEd and explained the academic processes within the Faculty. She discussed the relevant information that newly admitted students need to know of. Break-out sessions per program succeeded the Faculty orientation. Students were clustered according to their respective programs and were met by their Program Chairs. Asst. Prof. Reyes, Program Chair of AA program and Asst. Prof. Roja Rivera, Program Chair of Bachelor of Education Studies (BES) acquainted the new students of the ins and outs of the AA and BES programs. Asst. Prof. Maria Rowena Raymundo convened the students of Graduate Certificate/Master of Distance Education and discussed the program. On the other hand, Asst. Prof. Roel Cantada, Program Chair of Diploma/Master of Arts in Social Studies Education, answered the inquiries of the students regarding the DSSE/MASSE program. Ms. Rhonna Marie Vereña, University Researcher at FEd, met the Professional Teaching Certification (PTC) Program students and discuss with them the program description and requirements while Dr. Bagarinao did the program orientation for the Doctor of Philosophy in Education (PhD-EDUC) and Diploma in Mathematics Teaching (DMT). Break-out sessions were organized to give way for a more detailed discussion of the programs offered by FEd.